So I’ve been emailing my new food therapist Dr. Debby, and in the midst of our discourse I mentioned that I no longer seem to be limiting myself anymore where food is concerned. A couple of years ago I wouldn’t touch mac and cheese with a ten foot fork, but lately I’m all about the cheesy/fatty goodness. I told Debby, “it’s like my food filter is broken”. AHA! Ding ding ding! We have a winner! Because that’s exactly what it feels like. The filter I used to use to limit the amount and kind of food I ate has been turned off for quite some time. But why? Why did my food filter break and how do I unbreak it? I think the answer to the first question is twofold (I love saying “twofold”): 1) I just stopped caring and 2) I got out of the habit. I was under a lot of stress last year and food was my security blanket. I didn’t care that there were 1200 calories in the 3 bowls of ice cream I ate, I only knew that it tasted good. The less I cared about what I was eating, the further away my habit of limiting my foods got. So how do I un-break my food filter? Well, I think in the reverse way that I broke it. I’m starting to care again (seeing your highest weight ever will do that) and I just have to practice limiting my foods until it becomes a habit again. Sounds easy enough right? But I think it’s doable. I’ve got my duct tape and my elmer’s glue and some string and I’m going to try and fix my filter the best I can. Where’s that cute but annoying Ty Pennington when you need him? Ahhh Jill, I just love this post. Let me know how the duct tape and elmers glue work for you and I’ll go out and buy a whole case of the stuff, lol. Look at us, asking questions and posting about them on the same day. 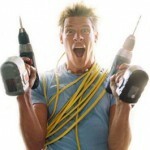 Cute but annoying Ty Pennington–good description! Oh, Jill, I know it’s such a slippery slope. I can relate.